** WAITING FOR AN ALIBI (3:30) is also featured on the album WILD ONE on which it features an extra verse (4:08). 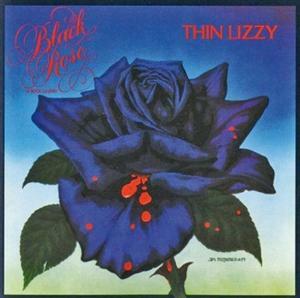 The three-verse version was also included on a 1987 compilation called The Best of Thin Lizzy & Phil Lynott: Soldier of Fortune on Telstar records. *** Some confusion exists about the song SARAH as Thin Lizzy released two songs of this name. Additionally, SOME copies of the BLACK ROSE album list the title of the track as MY SARAH. On the record face of my vinyl copy of this record SARAH is shown as written by PHIL LYNOTT yet the cover for that disk shows PHIL LYNOTT and GARY MOORE. A song named SARAH (version 1) can be found on the album SHADES OF A BLUE ORPHANAGE. That song is reputed to have been inspired by Philip's grandmother, Sarah. Another song, also called SARAH (or MY SARAH on some copies) is found on the BLACK ROSE album and is about his then-new daughter SARAH. BLACK ROSE is one of three albums produced by Tony Visconti. Visit Tony's website for his comments about his experiences. Although the details are not readily available, it is reported that the Black Rose album as we know it today is not the original release. Apparently at some point after being released, it was withdrawn and some tracks were removed and others added before it was reissued. Just The Two Of Us, released on a single, was apparently one of the cuts from the original release of the album. In 1995 Metal Blade Records in conjunction with Warner Bros. issued a remastered version of this album in the USA only. Slight packaging variations from the original release. Thanks, Brian and Leanlinny9, for some of the additional info.